Since most automakers are moving towards turbos for power and efficiency, it’s getting harder to find affordable cars with six cylinders. If you aren’t quite ready for the turbo takeover, there are still a few old-school holdouts that offer V6 power for not much money. Welcome to Ask Automatch! Where you get to ask me your burning car buying questions. Got a scenario or a situation and you aren’t sure what to do? Send me an email to Tom.McParland@jalopnik.com and I’ll try to help you out. It’s almost time to upgrade my V6 Camry with 150,000 miles. I want something with a little more power, but I’m just not confident in these new turbo motors and their ability to last a long time without some serious maintenance. The six cylinder in the Camry never gave me any trouble and it had a nice balance between power and decent gas mileage. I want something that is going to be reliable, but I don’t want to spend over $30,000. Most of the V6 options are around $32,000 and up. I know there are plenty of pre-owned cars, but I really only want to buy something new. Is it possible to get a nice V6 four-door under 30k? The availability of V6 motors around the $30,000 mark is shrinking, but not totally gone. Usually, someone with a V6 Camry might jump into another one or maybe give a V6 Accord a shot, but both of those have an MSRP of around $32,000. However, there other alternatives. Here is my ranking from worst to best. The Dodge Charger is going to give you the most attitude for your money, but if you’re looking for something that is going to run up the miles like a Camry, this is probably not your car. Also, the V6 SE is basically the rental-spec version without much in the way of upgrades and after a few months of driving it, you will wish you had spent more on the V8. On the surface, the Nissan offers a pretty good value as a Japanese four-door with a V6 under $29,000. Unfortunately, the 3.5-liter V6 motor is hooked up to an awkward continuously variable transmission that zaps all the character out of the engine. And despite its country of origin the Altima’s fit, finish, and overall build quality isn’t quite on par with its rivals from Toyota and Honda. The Taurus offers the cheapest way to get a V6 four door, but you get what you pay for. The 3.5-liter motor pumps out a respectable 288 HP and gets about 27 MPG highway, but the Taurus is such a heavy car that you really won’t feel that power, and despite being in the full-size segment it can be a bit cramped on the inside. If the size isn’t an issue I would suggest spending just a hair more over your budget and upgrade to the SEL for $30,650. The Chevy is the most expensive of the bunch, but the Impala is a very comfortable and a solidly built car. The 3.6-liter V6 is also the most powerful in this segment with 305 HP and will get up to 28 MPG on the highway. The Impala is a great cruiser that can eat up the miles and unlike the Taurus, you know you are in a big four-door with a spacious back seat and a huge trunk. 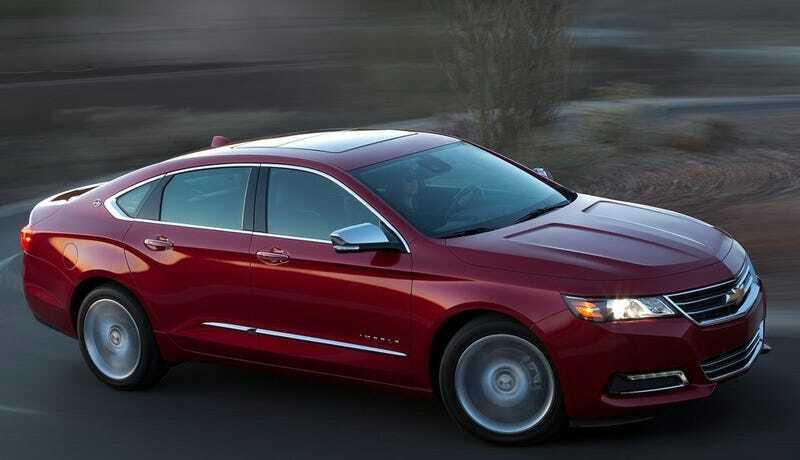 Consumer Reports named the Impala their highest ranking full-size sedan, and for a lot of buyers that is a crucial endorsement. The Chevy is the winner here, but even if their prices on paper put them over $30,000, I wouldn’t rule out another Camry or Accord just yet. Remember sedan sales are slow right now, so with some solid negotiations combined with factory rebates you might be able to get those imports below your threshold. I say drive all three, then comparison shop to find the best value for your dollar. Are The &apos;Sport&apos; Versions Of Family Sedans Any Good? What Is The Best Car For A Terrible Commute?